BROKEN MIRROR: WHY JUST REMEMBER? WHY NOT HONOUR AS WELL? WHY JUST REMEMBER? WHY NOT HONOUR AS WELL? 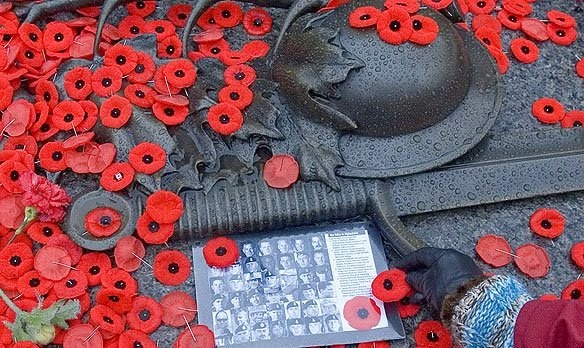 On November 11th in Canada, we stop to remember our fallen war heroes. Remembrance Day. It isn't even a statutory holiday. Why?! Do the fallen not deserve at least one day set aside for just them? Why even give the day a name if it isn't any different from any other? Oh, there are services, there are memorials, there are observances. I see it as a little too little. These men chose to serve their country, and gave their lives for it. Remember them? We should honour them officially. How many thousands went and served with honour and courage. How can we do any less? Shameful! Lest we forget? Seems we have. These men, boys really, went to a foreign country to fight a foreign war. They lived in deplorable conditions. In trenches of mud and dirt and wood. They lived with rats. They lived in bitter cold, without the proper clothing for such conditions. Their meals were quite meager. If you they could be called meals at all. Everything came in sealed cans and the only thing they had to open them with was their bayonets. They were issued spoons, but with nowhere to clean them, dissantary became a prevalent disease, which many died from. Many also died from other diseases and infection. Almost as much as those who died in battle. In both WW I and WW II, man invented many new ways to kill each other, but no way to not war in the first place. Got a little off topic, but I just wanted to illustrate what conditions these men went and lived and died in. All for freedom. And we can't as a country that is free because of their sacrifice will not, for some unknown reason, truly and properly honour them. Now, don't get me wrong, I love the country of my birth and my home, Canada. But those elected by the people for the people are shameful in my eyes. They can hold all the observances and services they want, but it's just pretend for them. A hollow and empty gesture. If I were a vet I wouldn't even bother attending them. Perhaps that's a little too harsh. It is, after all, something, if not nothing, where they can go and remember their friends. Giving them the honour they deserve. But, the politicians do not deserve to be there. Again, I say, a hollow gesture. Anyway, putting all this aside, we as a country, as a free nation, should take the time to bow your heads in remembrance of those who fell so we could be a free nation. All honour should be accorded them. Lest we forget. I for one, salute the fallen Canadians and I salute as well, those who were able to come back home to the freedom that their friends and allies selflessly sacrificed for. One last thought, I must say it is a shame that we must take time to remember or to honour the fallen. For they should not have had to go and die for our freedom. It's a shame we as a nation define ourselves as a nation because our sons and fathers went and fought a foreign war, many giving their lives in the process. We call ourselves brave and gallant warriors, both courageous and determined. We call ourselves great, but how does war make one and many great? Go they did, and fought and sacrificed. All honour and remembrance is due them fully. May those who serve their perspective countries in present "wars" not have to sacrifice but may they all return home alive and live the freedom that they helped keep. Many prayers for our sons, fathers, daughters and mothers who have chosen to serve their country. May God keep them and protect them all.